Hurricane Florence has wreaked havoc in the Carolinas, and we are all torn by the devastating images we see by the hour. We in the Richmond area got our own taste, with a series of tornadoes rolling through the area, hitting Chesterfield County particularly hard and bringing widespread flash flooding. Indeed, flash flood warnings have been issued regularly throughout the state and Florence, in downgraded form, has been drenching southern New England and has caused flooding in New Hampshire. While Virginia didn’t get hit as hard this time as we’d all feared, what has occurred is bad enough. And besides – we know our address is on Hurricane Alley. The names Sandy, Gaston, and Isabel are just a few of those seared in our memories (see list). Rep. Dave Brat (R, VA-7), however, has voted consistently against funding hurricane andother disaster relief, even though Virginia has relied on such assistence on numerous occasions in the past and certainly will be this year in the aftermath of Florence. 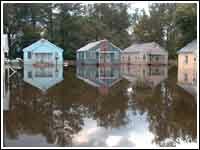 For example, following Hurricane Isabel in 2003, 93,139 Virginians applied for federal relief from 99 jurisdictions in Virginia, and by January 2004, the Federal Emergency Management Agency (FEMA) had approved $257 million to individuals and businesses in Virginia to help them recover (details here). Brat has also voted against extending funding for the National Flood Insurance Program (NFIP), despite that Virginians have received $720,147,929 in claim payments from the program since 1978. Communities participating in the NFIP include all but one of the counties in Brat’s district: Amelia, Chesterfield, Culpeper, Goochland, Henrico, Nottoway, Orange, Powhatan, and Spotsylvania. 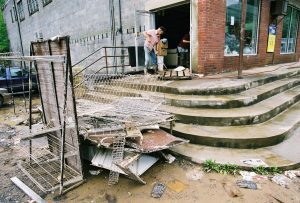 Man mucks out his store in Hurley, VA after a flash flood in 2002. Brat’s hardline position against offering emergency aid to fellow Americans – and to his own constituents – flies in the face of Central Virginia’s values. We believe in neighbor helping neighbor. Most Americans do: 88% believe that the federal government has a duty to provide aid in natural disasters. It’s called compassion, and the human race probably wouldn’t have survived without it. But compassion is lacking in much of Dave Brat’s voting record; in fact, during his first term in Congress, Brat earned the nickname the “Abominable No-Man” for his refusal to fund – well, just about anything. Brat has explained his votes by citing his concerns over the federal deficit and the national debt (the debt is the accumulation over years of deficits). Brat uses fear to whip up support for his extremist and minority view of the state of the economy. Likening the US economy to a household budget – something politicians of all stripes do – Brat insists that doom awaits if we continue to be in the red. The short answer is “no.” The US economy is a tad too complex to be tallied in a checkbook register, and most working economists (vs. armchair theorists like Brat) had not been particularly alarmed – up until the start of President Trump’s Trade War. According to this Fortune article, because the US economy is the most powerful in the world, it can outmuscle its debt provided it keeps on its traditional path and does not adopt the tariffs and the anti-immigration policies advocated by Brat (following Trump). These protectionist measures are the greatest threat to the health of our economy, not helping Americans rebuild after disasters. But Brat takes the pearl-clutching view of the economy. And he is apparently unmoved by images of devastated families and businesses, voting again and again to oppose hurricane and flood relief. Leaving compassion aside – what a nearsighted view he has! Surely from a strictly economic point of view it can only aid economic growth for families and businesses to get back on their feet and contribute to the economy again as quickly as possible. While there are legitimate criticisms of the NFIP (see here), and the program needsreform, Brat’s statement is patently false: The NFIP insures more than 5 million homes, and Americans in all 50 states have received claim payments from the NFIP. Brat is correct that over the course of the NFIP’s 50-year history, some wealthier counties have benefitted disproportionately from this program (not, however, “on both coasts,” but primarily in Texas and Florida) – but so do many lower-income counties. There can be no doubt that most of the voters in Brat’s district who live in communities participating in the NFIP would be hard-pressed to recover from serious flood damage without this program. And, as we in the Richmond area well know, we don’t need a hurricane or tropical storm to have flooding. Urban and suburban areas have become far more prone to flooding simply from heavy rains, as increased growth leaves less open ground to absorb water. Greater density of construction, and even the flood control walls that prevent rivers from overflowing, sometimes also cause flooding by catching and holding run-off rainwater. In addition, hundreds of thousands of Virginians live within the flood zone of creeks, rivers, dams, and reservoirs. Just last month, parts of Lynchburg were evacuated over fears that College Lake Dam would fail and cause Lynchburg to be flooded with 17 feet of water in seven minutes. And then there’s sea level rise: a recent study has shown that Virginians living on the coast have lost $280 million in home value since 2005 owing to floods caused by the rise in sea levels. 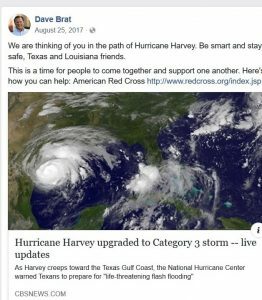 August 25 2017: in advance of Hurricane Harvey, Brat sends these warm thoughts to “friends” on the Gulf Coast. September 8 2017: two weeks later, Brat has forgotten all about his “friends” and voted “no” on H.R. 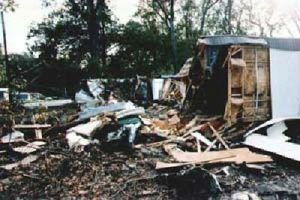 601: a hurricane disaster relief and long-term recovery bill. The bill passed the House with huge bipartisan support (316-90), passed the Senate by a wide margin, and was signed into law by Trump. Brat was way outside the norm on this one. Dave Brat talks the talk, but walking – not so much. These are lofty words, but what about action? When Brat had had the chance to “come together to help” victims and show them compassion a few days earlier, he chose to turn a deaf ear. 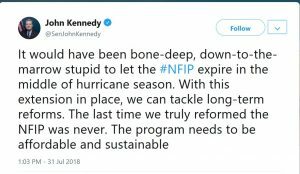 Not mincing his words even a little bit, Louisiana’s Sen. Kennedy (R) acknowledges the need for reforming the NFIP – but also for immediate action. 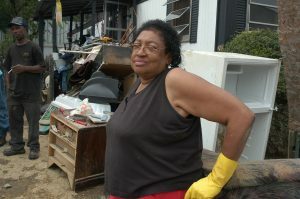 But Brat voted with a tiny minority to strip this vital program of funds not only right in the middle of the hurricane season that is upon us today, but a few months AFTER floods in Central Virginia, including in his own district: Culpeper, Goochland and Henrico, and the Richmond area had all recently been hit when he cast his vote. 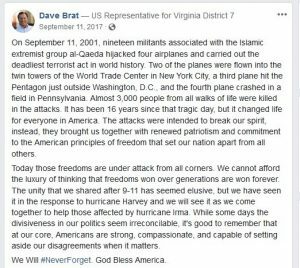 Dave Brat has shown plainly that he is driven first and foremost by a hardline ideology that is based on factual error, blind to practical realities, and void of compassion. As we approach the midterms, we voters in the 7th District should bear in mind that if Dave Brat were not in an extreme minority in Congress, and votes had gone the way he wanted, he would have left us high and dry in the middle of hurricane season – and not the kind of high and dry we want!